Ink for Autism is a nice idea to help out those affected by the disorder and it’s cool to see the tattoo industry getting involved – Ontario, Oregon, Australia! Dress code: a tattooed midwife doesn’t cover up her tattoos and wants to change the way people look at tattooed women, Denver Police Department considers a new dress code requiring covering up tattoos after all and both defiant and naïve article ‘I’ll never cover up my tattoos for anyone ever again’ (which makes a mouthful ;)). 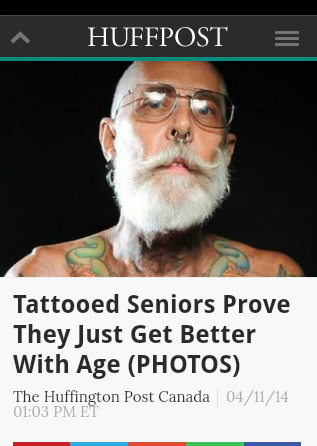 Tips from tattoo artists all over the world – a German old school artist discusses animal tattoos, some words of wisdom from an American tattoo artist, tattoo care tips and a bit controversial article quoting extensively Junior of Junior Ink in Poland who says that people tend to copy others’ designs instead of trying to be themselves. 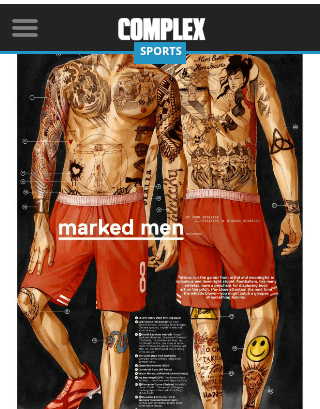 A weird project by an American illustrator – have you ever wondered how a person would look if they have tattoos owned by famous soccer players? Me neither but here’s the answer (plus a shot above).